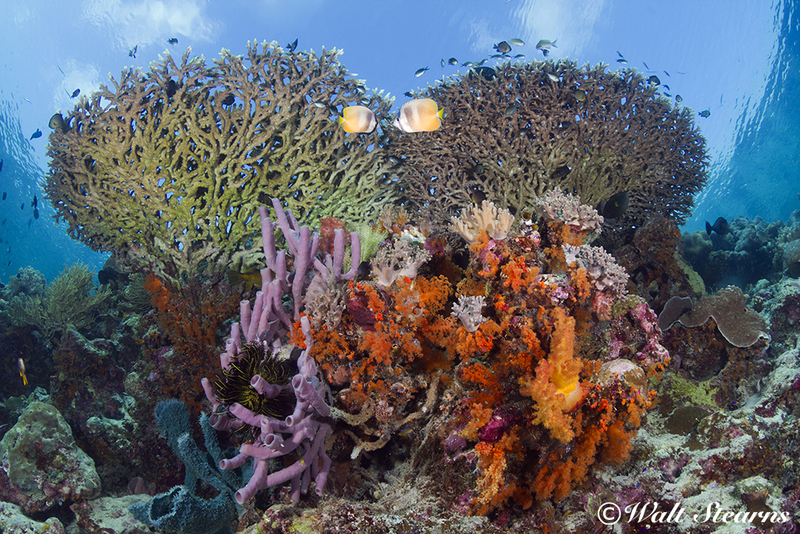 Wakatobi’s House Reef is often described as one of the “best” house reef dives in the world. 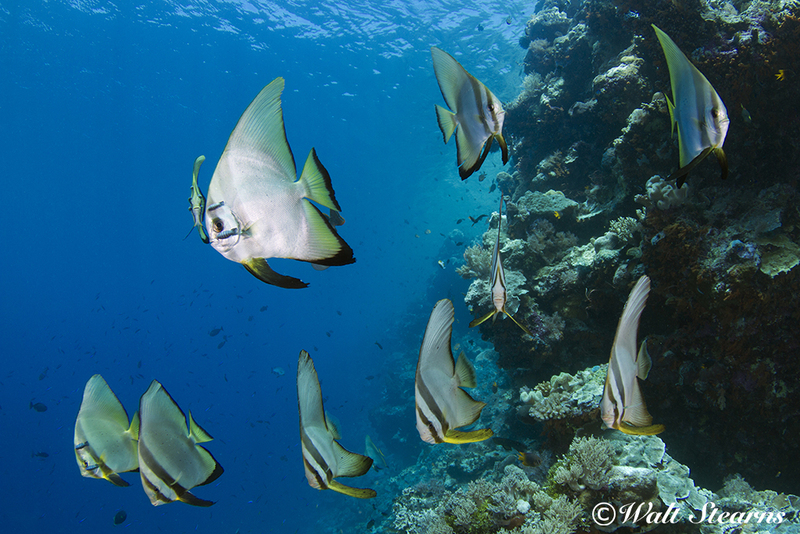 A house reef is the name typically given to a site that's easily accessible from a dive resort, usually right off the beach and within easy swimming distance. Having been to a wide number of resorts in the Caribbean, tropical Pacific and Indo-Pacific I have seen my share of “house reefs.” Some were quite good. 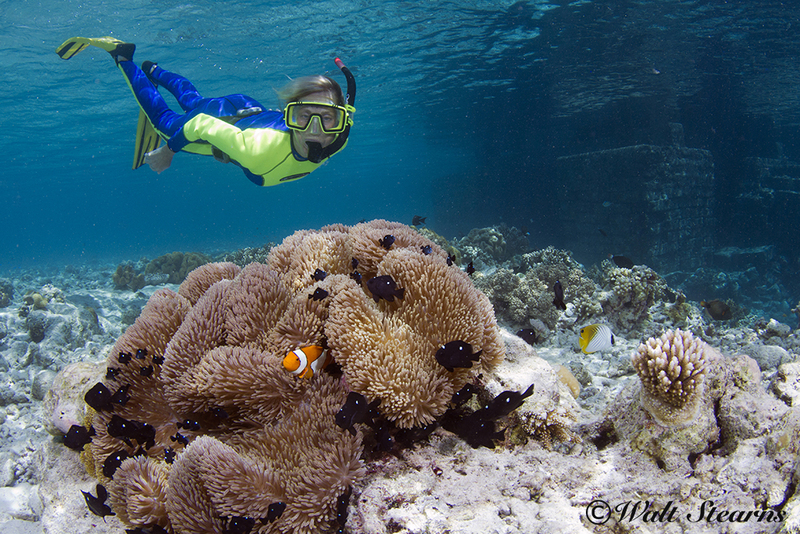 With interesting features such as wrecks or vibrant coral gardens. Others were, well… not so good, offering little more than a pleasant spot for shooting macro, or simply getting in one more easy submersion after the two-tank morning dive. 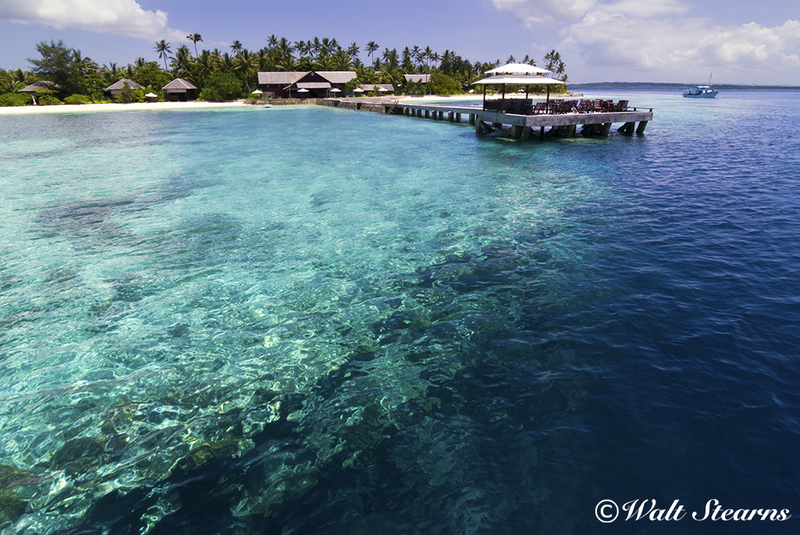 Then there is Wakatobi Dive Resort's House Reef. You arrive at the resort by boat, and step onto an 262-foot/80-meter long jetty. 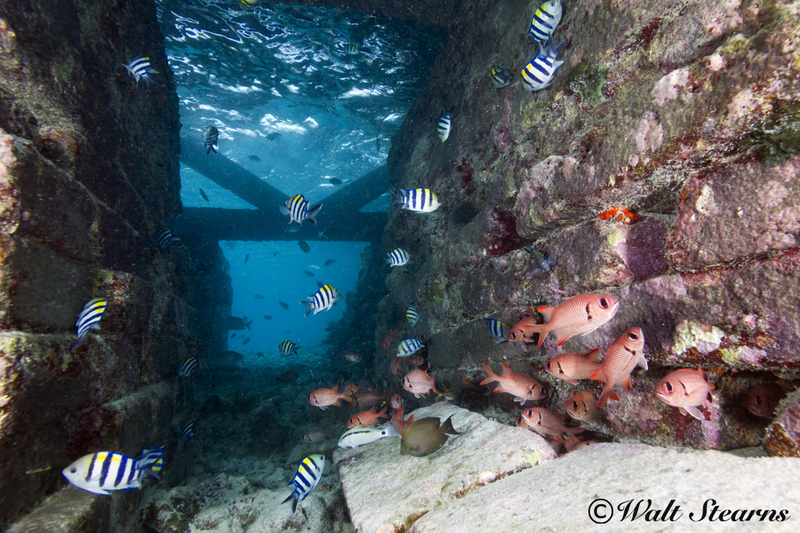 Right away, you will notice that the outer end of the pier perches on the edge of the reef, which drops precipitously from snorkeling depth into a dark blue void, stirring the imagination for what waits below. In between this deep blue boundary line and the gleam of the white sand on the beach is a broad expanse of shallows with a montage of sea grass beds and coral formations. With depths varying 3 to 5 feet, 9 feet at the most, the shallows provide an ideal calm water setting for even a novice snorkeler. This seascape transitions gradually from knee-deep shallows to a depth of around 9 feet/2.7 meters at the edge of the drop off. 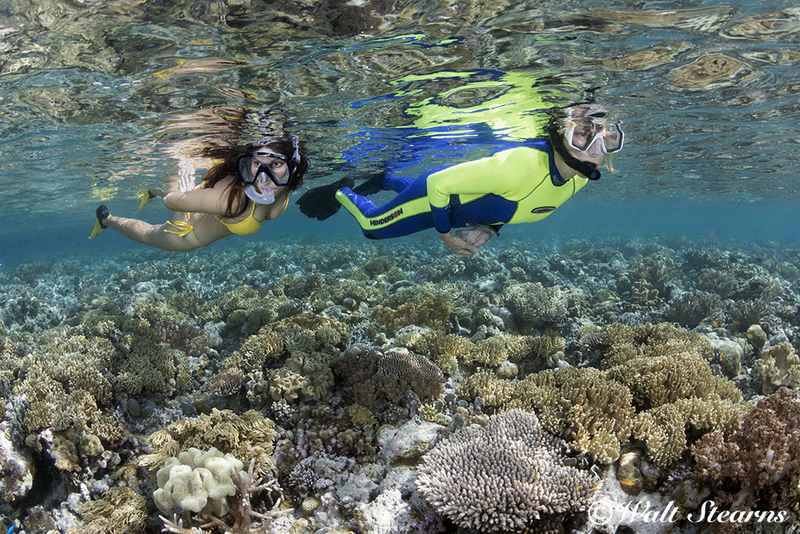 In between, divers and snorkelers both will find the coral growth to be remarkably healthy and quite dense in places. It's something you wouldn't expect so close to a resort. At the end of the shelf, the House Reef takes a very sharp turn downward making a near vertical plunge to 250 feet/76 meters, where it supposedly bottom outs. Being that the water is quite clear (based on the tide you can expect 90-foot/27 meter-plus visibility) ambient light filters down quite deep, helping to showcase broad vistas of underwater terrain. 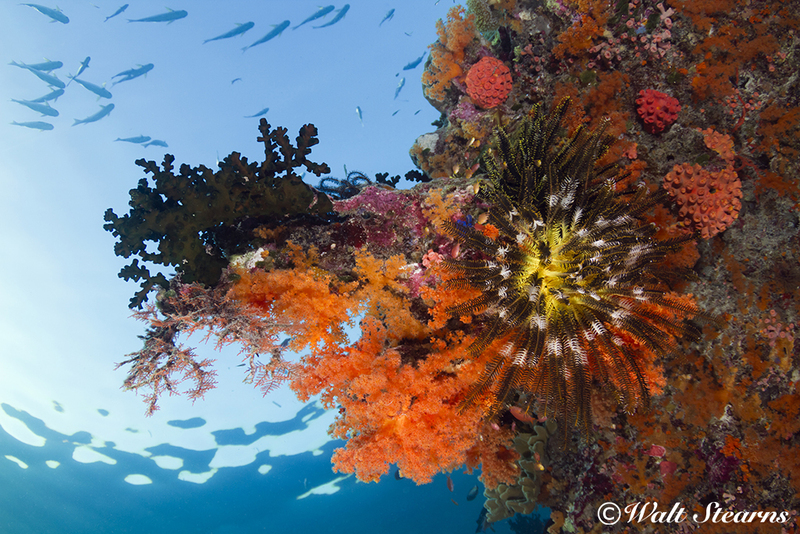 The slopes and walls are overgrown in a diverse array of hard and soft corals, gorgonians and sponges, invertebrates and fish, with the mixture of species changing as depth increases. The wealth of macro subjects I have found here is innumerable, from the more expected like anemone fish (seven different species inside a 100-foot/30 meter circle of the resort’s jetty), to the sublime, like pygmy seahorses. Four of the known seven species of pygmies are found here: Bargibant, Denise's, Pontoh's and Severn’s pygmy seahorses, plus the recently described pygmy pipehorse (Kyonemichthys rumengani). Passing by the under side of the end of the Jetty, it's hard to not pause and have a peek under the structure to see what’s there. In addition to providing shade for schools of fish, large concrete columns and beams are home to an assortment of shrimps and crabs. With reef contours of this nature, it's easy to perform multi-level dives with bottom times of 70 to 80 minutes without going into decompression. And time spent off-gassing in the shallows can often be the most interesting part of the dive. 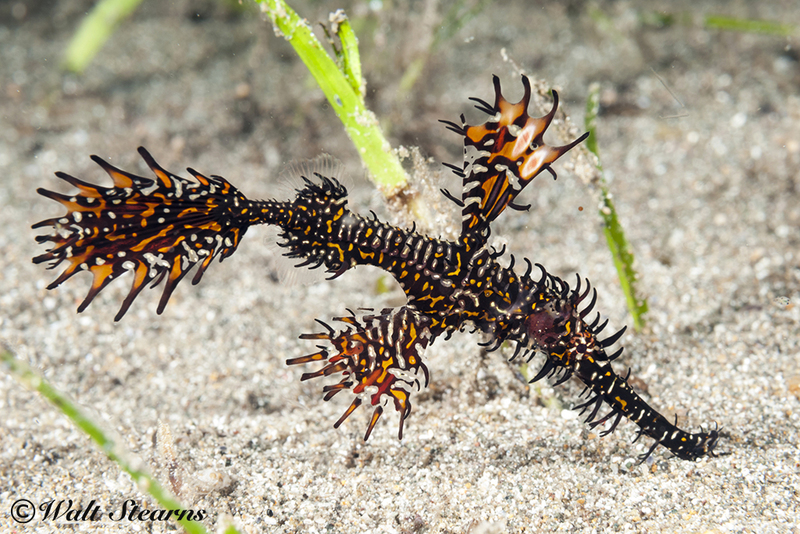 Searching around the grass beds and branching coral colonies in the sunlit shallows have rendered subjects ranging from Pyjama cardinal fish to robust, halimeda and ornate ghost pipefish. 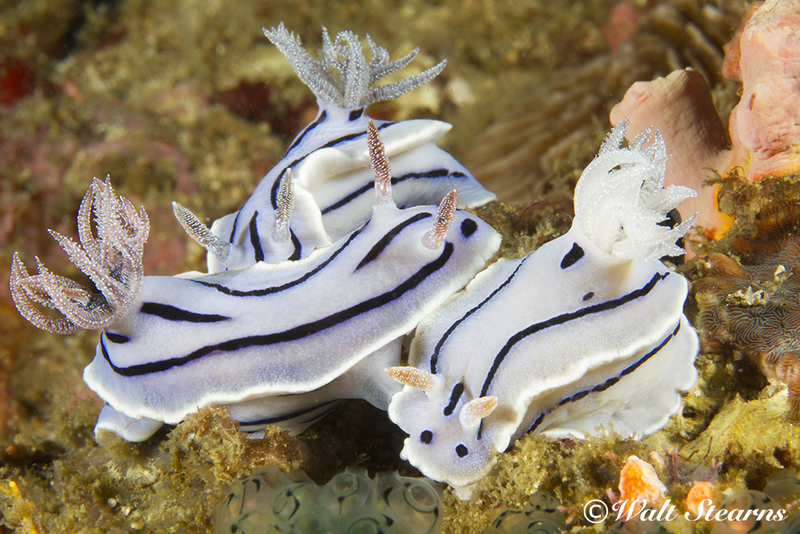 Then there are of course the invertebrates, which include a bevy of nudibranch species. And when the sun goes down, the life on the bottom becomes a carnival of color and small creatures of the weird and wonderful. 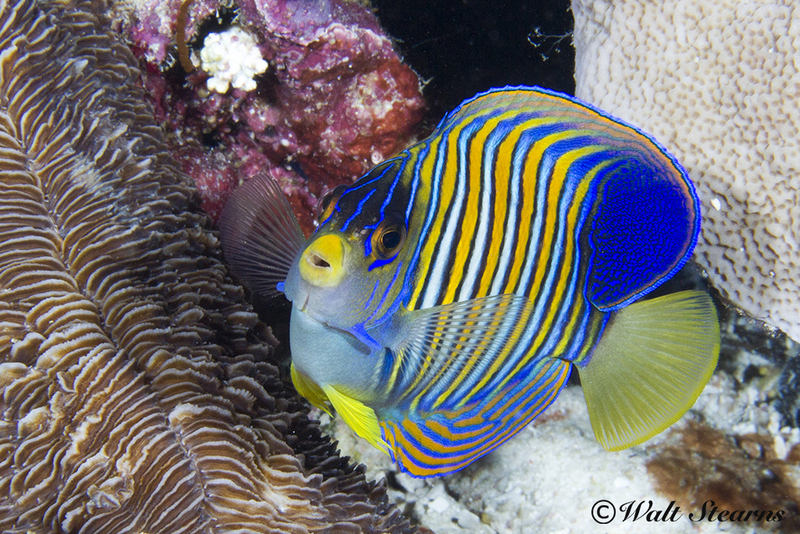 Though it is easy for photographers to get lost in their quest to capture many of the reef’s smaller residents, I would be rather remiss if I did not include that there is also plenty of opportunities to get the big picture. Sections of the House Reef’s wall are quite vertical, allowing you to get in close without worrying about touching the bottom with your fins. 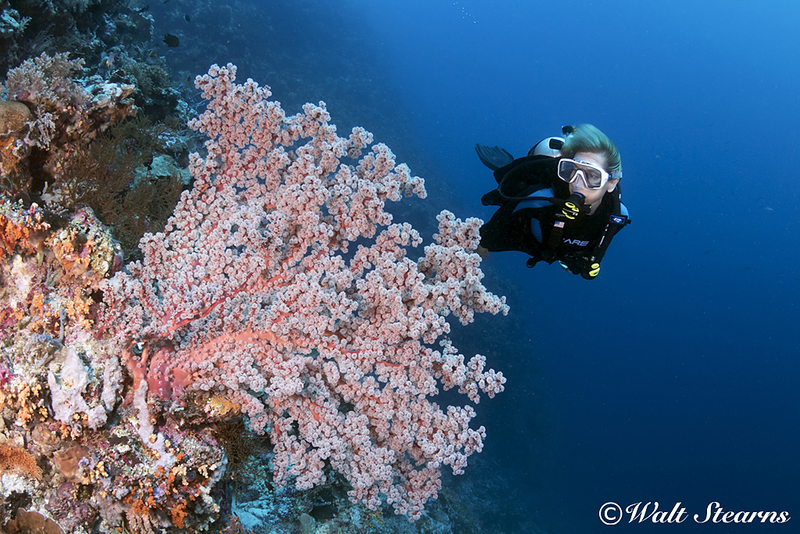 Down the wall a diver views a red and pink hued cherry blossom coral (Siphonogorgia godeffroyi) in the family Nidaliidae, which is just one of wide variety of soft corals found on the House Reef. 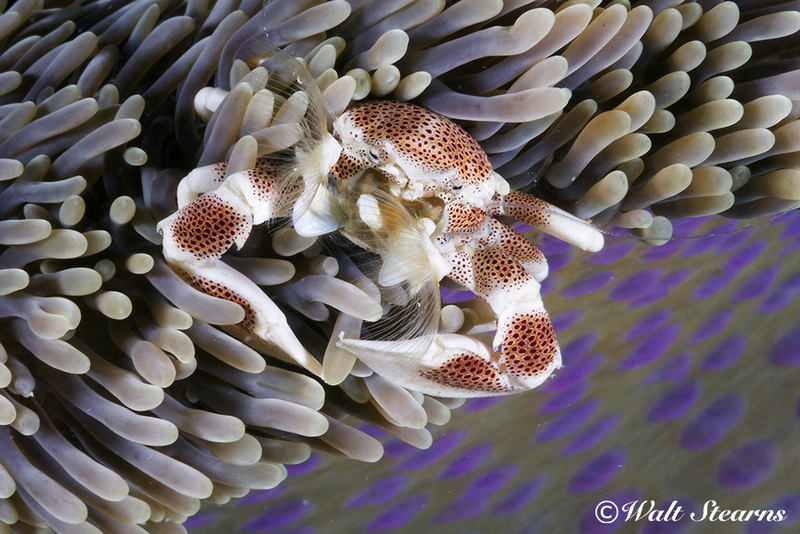 Not all of the House Reef marine life is small. 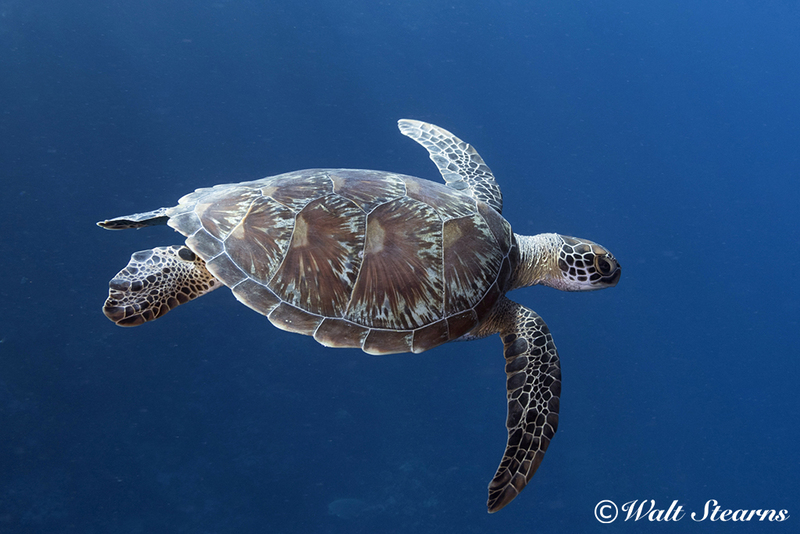 When diving the wall encounters with green turtles either cruising next to the reef by day, or sleeping beneath an overhang by night is a regular occurrence. 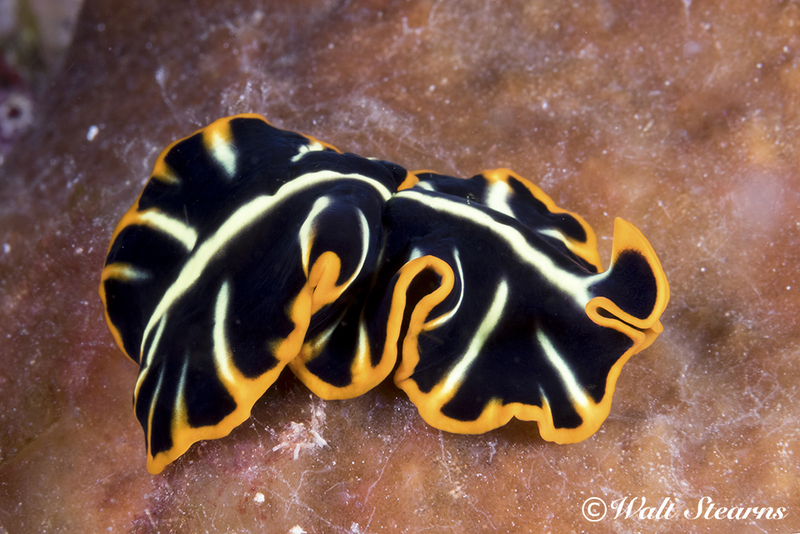 I often favor wide-angle photography over macro when underwater clarity is good, which is about all the time here. 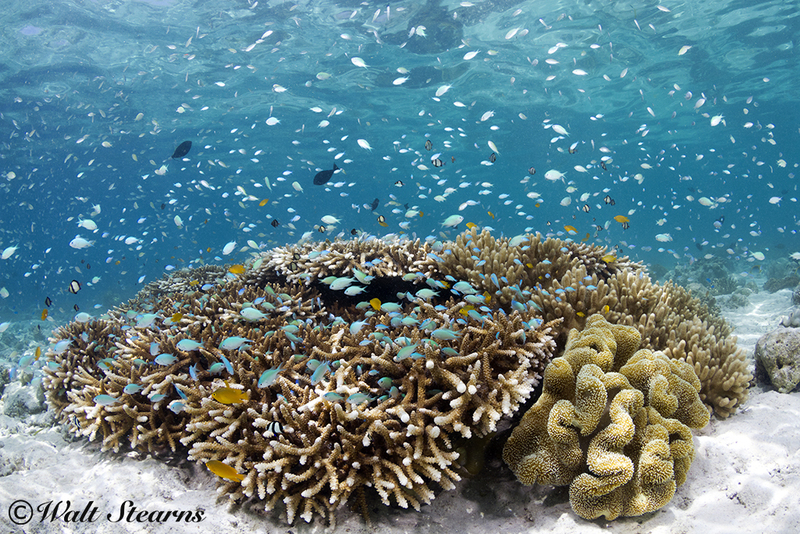 Unlike many near-shore sites, the coral formations on the shallows of Wakatobi's House Reef are quite beautiful. With the added pop of an underwater flash (or two) the vibrant detail of many of these coral colonies will just about jump out of the frame. Divers and snorkelers need not fight current's ebb and flow. In addition to the ‘pool’ being always open (the dive center personel have a watch between 6 am and 10 pm) Wakatobi also provides a taxi boat drop off service for guests diving the House Reef. On request, the dive center’s staff will take you and a buddy to an up current section on the reef aboard one of the resort’s skiffs. For example, when the current is running south to north, your drop can begin at Turkey Beach, which has excellent hard corals. Should it be north to south then your dive will begin on the House Reef’s north side neighbor Tanjung Patok, which is great for soft corals. 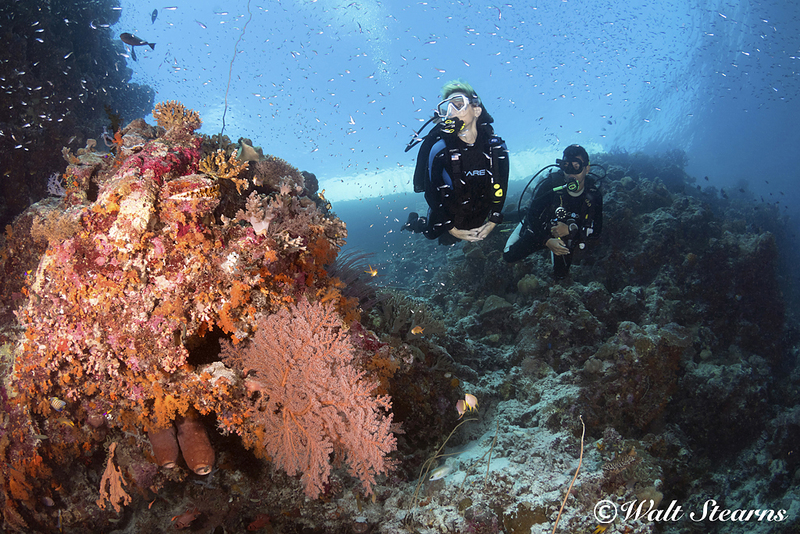 If your buddy opts out, a Wakatobi dive guide will accompany you on the venture. With more than 40-plus named sites accessed by the resort’s day boats, and the opportunity for three daily dives of up to 70-minutes each, it would be easy to think of the House Reef as just an optional add-on for the afternoon. 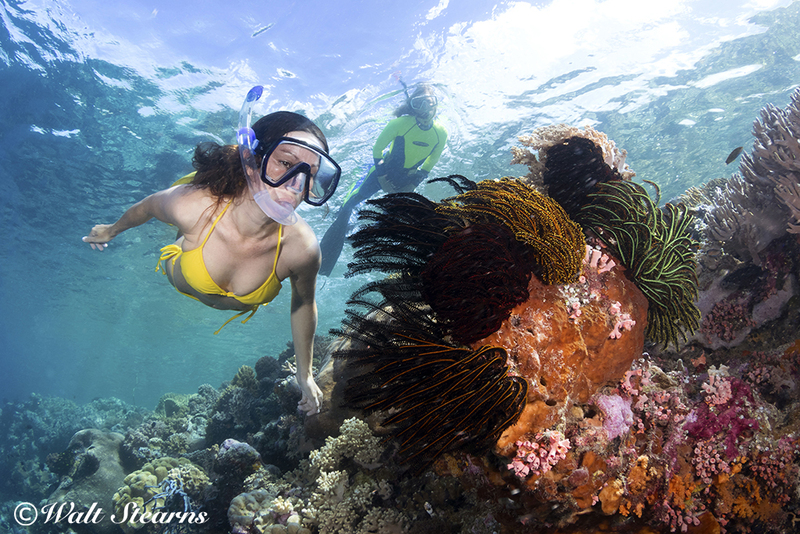 But don't rule out the idea of making the House Reef an all day adventure. Because, as house reefs go, this one is not just a cut above the rest, it rules. 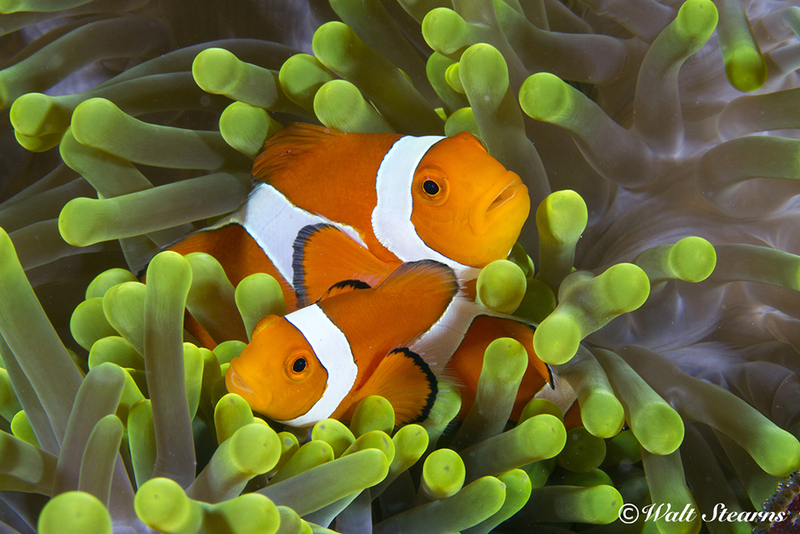 0 Comment(s) to the "Wakatobi’s House Reef - why this house rules"